Cabbage rolls offer all of the flavors of a delicious German Oktoberfest inspired dish. While I love the taste of cabbage rolls--I'm not in love with amount of time it takes to make them--or the effort involved in rolling them! Then I realized that we could have all of the flavors of our favorite cabbage rolls in a casserole form with less work. The casserole form is also easier to eat as well--especially for the kids--with no knives required! 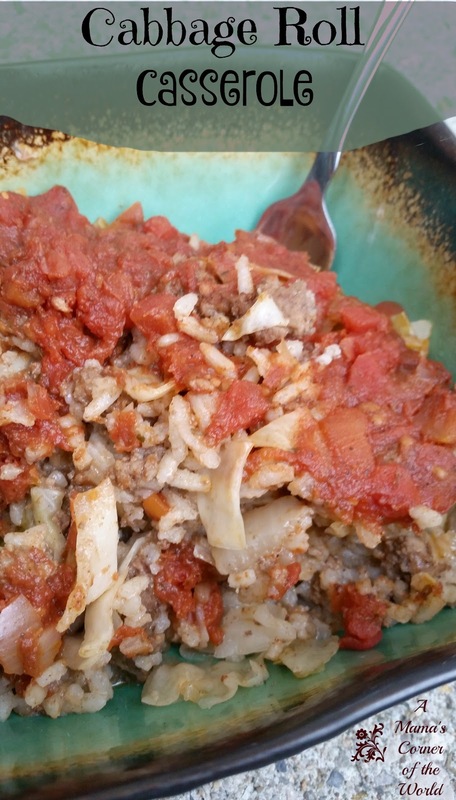 What is my favorite go-to Cabbage Roll Casserole Recipe? We were not directly compensated for this post--but, we may receive slight compensation from affiliate linking within our posts. Steam the Cabbage. Add the cabbage to a large Dutch oven or stock pot. Cover the cabbage with water and bring to a rapid boil. Reduce heat, cover and continue to simmer for 5-10 minutes or until cabbage is slightly cooked. Drain water from cabbage and set the cooked cabbage aside. Prepare the sauce. Add the tomatoes, the tomato sauce or marinara, brown sugar, lemon juice, onion, spices, and water into a large soup pot or Dutch oven. Stir the ingredients until thoroughly combined. Bring the mixture to a boil, reduce heat, cover and simmer for 30 minutes. Stir occasionally to avoid sticking. Prepare the meat and rice filling. Add the ground meat and diced onion to a large skillet and fry until the meat is cooked through and the onion is translucent. Drain away any meat drippings. Add the spices, the rice, Worcestershire Sauce, and season with salt and pepper. Heat the filling until heated through and flavors are well combined. Layer the cabbage roll casserole. Begin with half of the cooked cabbage, half of the meat filling and half the sauce. Repeat the layers and cover the remaining sauce. Cover the casserole dish and bake at 350 for 30 minutes. Notes: This dish is the typical casserole--it tastes great a day or two later as lunch or even dinner leftovers!